With built-in lubricants, there is no need for elaborate lubrication systems. Water can also be used to lubricate METALON bearings. shape and size, without cracking, deforming, or deteriorating. the bearing surface and between the bearing and the housing. METALONs are very versatile materials. You can turn, drill, tap, shape, jig saw, mill all grades. operating environments often found in sleeve bearing applications. In fact, under many severe conditions. materials in providing longer trouble-free operation. Because of its exceptionally high impact strength. METALONs possesses unusual ability to absorb shock loads. They performs extremely well under vibration and misalignment conditions. Since METALON tends not to carry abrasives, shaft wear may be reduced when compared to other bearing materials. In making an evaluation, however, shaft wear should be related to length of service. If, for example, an METALON - Oillon bearing outwears extruded nylon by 2:1, a fair comparison of shaft wear would be with the total wear down produced by two nylon bearings. In comparative test, METALON-OILLON has caused less shaft wear than the other METALON grades. dimensions before and after immersion, and also checking hardness. Any significant variance from the METALON standard would indicate possible compatibility problems. METALON has a higher coefficient of thermal expansion/contraction than metallic bearing materials, although not as high as many " plastics . This factor offers a significant advantage when fittingbearings, as freezing causes contraction and therefore makes fitting with interference fit very easy. When bearings are subjected to higher temperatures, allowance must be made for the reduced running clearance caused by thermal expansion. When METALON bearings will operate in a cold environment, an appropriate amount of extra interference must be provided to offset thermal contraction. Unlike plastics and metals. METALON is not a malleable material. It resists the " pounding out of shape which frequently occurs when metal or plastic bearings are subjected to impact. As wear clearance develops in conventional bearings, the increased potential for " hammering can cause rapid failure. It should be note that greater clearances in METALON bearings as a design consideration, will not result in this type of failure. On full rotational bush bearings where high PV's dictate that a forced water-cooling system is required, the recommended minimum flow of @ 0.15 liters per millimeter of shaft diameter. METALON stays flexible at temperatures down to 60 o C. METALON is not recommended for hot water or steam applications due to potential Hydrolysis problems. Water over 60 o C should be avoided unless exposure times are short. 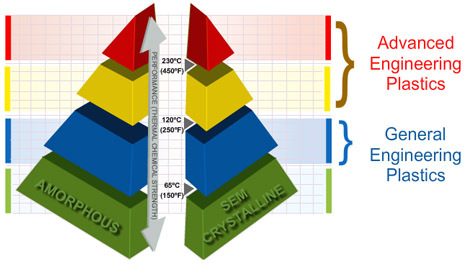 An upper limit on environmental operating temperature of 120 o C is suggested and although test conducted in laboratory where METALON bearings have successfully performed at higher temperatures, physical properties of the material are reduced, where operating temperatures in excess of 120 o C are expected, do not hesitate to consult us. NOTE: Frictional heat generated in high-pressure applications must be dissipated at the same rate to avoid seizure. available in Rods, Sheets & Tubes METALON-OILON has the best dry running capability, abrasion resistance too It is the most unique grade of METALON-OILON , and is becoming increasingly popular. It is used in high-pressure thin walled bearings, and for highly loaded rudder bearing applications where there is a risk of adhesive wear. POLY ACETAL & is used in the food industry in non-food contact areas where no grease is permitted. For food contact applications, a special FDA grade is available. ERTALYTE is to be used. In the manufacture of METALON Compact bearings supported by a metallic sleeve to give rigidity to the softer liner. These Composite bearings are available as per customer's requirement. This term is used in connection with elastomer engineering. It is influenced by wall thickness and he bearing L/D ratio. Since an average METALON-OILON bearing has an L/D ratio of 1.25:1, and a wall thickness proportional to shaft diameter, a typical shape factor of 8 can be used. Increasing the shape factor can increase the load bearing capability of the bearing. The METALON-OILON bush bearings are based on use of a high shape factor. material does not undergo a change in volume, but rather a change in shape. The extent to which such a change in shape can be acceptable in a bearing application depends on the type of movement involved. We define the maximum acceptable amount of deformation for full rotation as 1.25% of the wall thickness. For oscillating movement this limit can be extended to 4.0%. to publish absolute dry PV (pressure-velocity) figures for the METALON grades. We must consider the specific combination of pressure and velocity and relate this to the time factor (duty cycle) as this too influences the probability of heat accumulation. If the assembly operates over a short duty cycle, it has time to cool down between operations and therefore may be able to accept higher pressure and velocity figures than a similar assembly running continuously. Obviously lubrication has a major influence on PV-T limits, and therefore grooves are provided for dry, grease lubricated, oil bath and water bath conditions. He PV-T graphs were developed using a bath of oil or water. If the system can be designed to incorporate a forced flow of lubricant instead of a bath, much of the frictional heat will be dissipated by the flow of lubricant. Once the bearing is operating under hydrodynamic conditions, no additional frictional heat is develop as the speed is increased, other than a slight increase in frictional drag of the lubricant. This increase is so low that it does not affect the bearing operation. Velocity can be increased significantly (compared to a bath-type system) as long as there is sufficient flow of cool lubricant to dissipate the frictional heat generated.